Can I really learn web development? We truly believe anyone can become a web developer – we’ve been helping people from all walks of life become web developers over the last four years. It’s no easy feat, but definitely achievable if you have the right amount of motivation, passion and guidance. Passion for the subject (what is compelling to you) and motivation for the pursuit (your lifejacket) will serve as fuel on your journey to starting a career in web development. However no amount of fuel will help you get to your destination if you don’t have something to guide you in the right direction. What kind of guidance do I need? First, let’s focus on what you need to consider when looking for options to help you get started. How do you learn best? Don’t think about what you enjoy, think about what you remember (effectiveness). Do you prefer to be left alone at a library, or do you like interact and learn together with peers? Do you value flexibility and want to manage the pace your studies, or do need more rigid structure and schedule to guide you along the way? Know your learning style and try to find a method (or a few methods) that compliments it. Like sports and crafts, it takes time to learn and achieve proficiency in web development. Even the most intensive web development training courses take around 12 to 16 weeks at 40 to 50 hours a week to train someone from beginner to job ready. On top of that, you also need to be realistic about how much time you can actually spend on learning. It’s good to be aggressive and give yourself stretch goals (we’ll talk more about goals later), however, you need to be realistic. Will you burn out from studying it full-time for 12 weeks straight? Are you better off allocating an hour or two learning web development during evenings and weekends? Free programs are a great way to get started and get your feet wet. But if you really want to survive in the deep waters you may need more than that. Cheap doesn’t always mean bad and expensive doesn’t always equal good. Do some research, some programmes offer subsidies, scholarships, discounts and reimbursements. Read reviews, look at the alumni of various course providers. It will take an investment of time and money on your end, but if you keep working hard you will soon reap the rewards. Going through the exercise of understanding your learning style, time constraint and availability of funds can help you determine what the best way is to dive in and get started. However, avoid getting into a situation of analysis paralysis where you feel like you can’t afford to make a “wrong” decision. This is especially true when choosing what technologies to learn and how to learn them. Here are some options you can consider. Books are a great resource if you prefer learning on your own and at your own pace. They are also a great option if you intend to start learning part time. Start with an intro to programming, then continue with a book that allows you to build web applications. Online courses give you the freedom and flexibility to plan your learning time around your busy schedule, instead of the other way around. This is especially appealing if you’re considering giving programming and web development a try while holding down a full-time job. Learning online can get pretty lonely, so these are more suitable for self-starters who can stay motivated without external support. Classroom-based courses provide a physical environment and supportive community for you to detach from your regular (and distracting) surroundings and really focus on learning. The downside is that they are often much more expensive than online courses. The fixed schedules also mean that you have to keep up with the pace of the class or risk falling behind / dropping out. Online + classroom-based (blended) courses offer the best of both worlds. You are able to access all of the learning content online 24/7, anytime, anywhere. Simultaneously, you can attend offline events and meetups designed to bring the students together to struggle, support, challenge, grow and have fun with each other. Blended courses are often more affordable than classroom-based courses without sacrificing quality or outcome. Here are some schools offering blended web development courses in Singapore. No matter what form of training you choose, you should supplement it by immersing yourself in the industry. 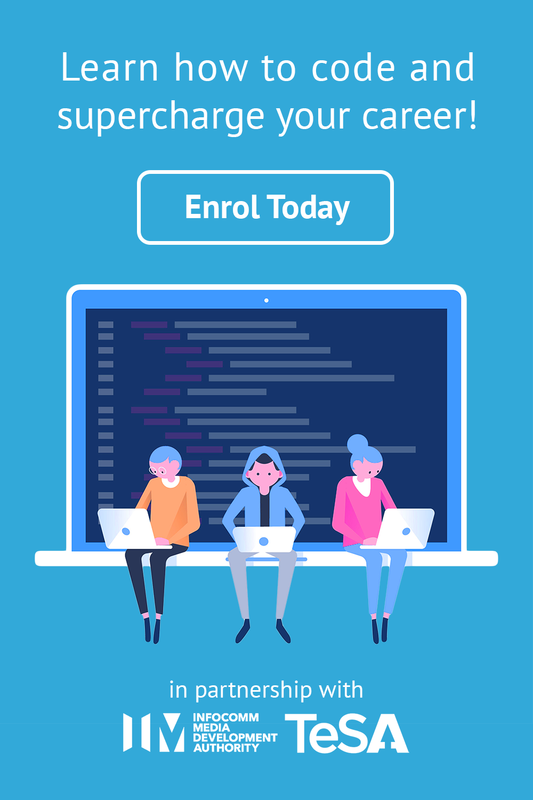 Some of the courses like Codecademy’s intensive programme and ALPHA Camp’s blended web development programme offer code reviews and mentorships by industry professionals. In addition, Singapore has a very vibrant web development community that is very welcoming to beginners. Consult Part 1 of our Web Development Career Guide for more tips and resources on how to get started. As you embark on this voyage, you’ll no doubt struggle, feel disheartened and maybe even want to give up. Everyone struggles and swallows a lot of water while trying to keep their heads above it. Don’t be discouraged if you feel overwhelmed, we’ve all been there! Keep swimming and after you’ve reached a few milestones you’ll have a better idea of whether or not you want to pursue this as a career.